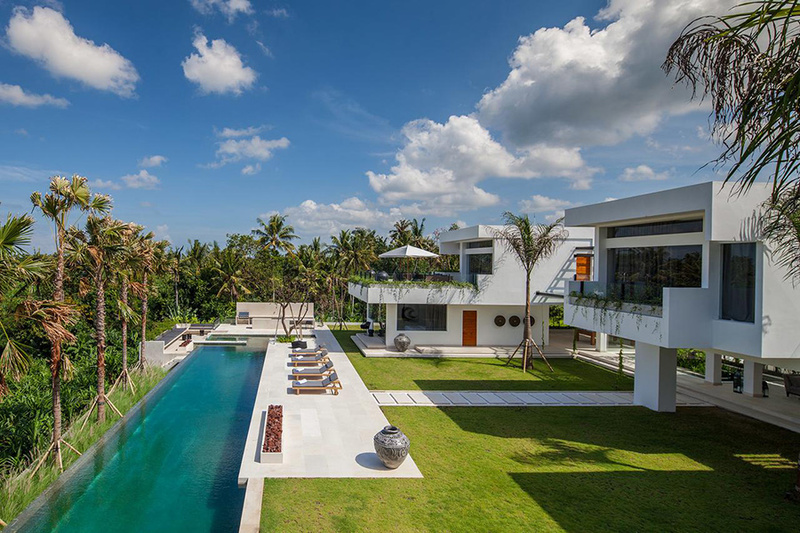 Experience luxury villa living at this contemporary retreat located amongst the picturesque rice fields in Bali’s Canggu area. 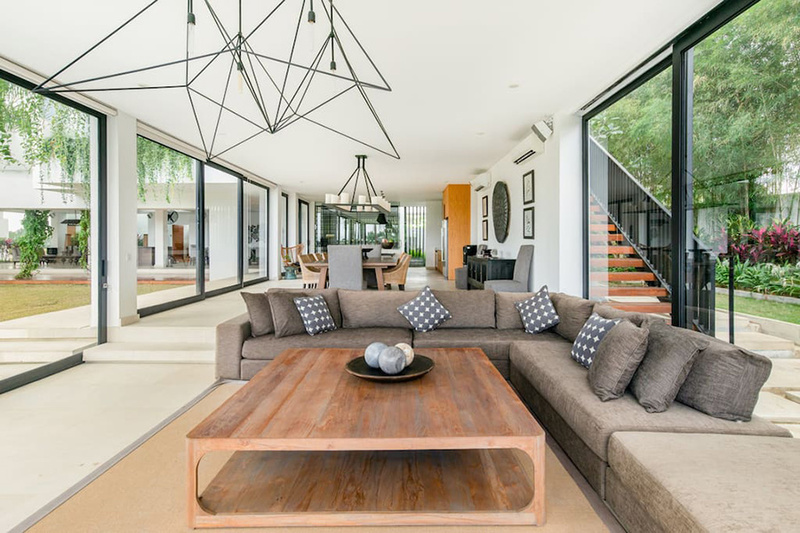 The Architect and Interior Designer, Felipe Gonzalez (SUKYF & Architects) and Ros Hemley (The Interior Space Australia Pty Ltd) have created a unique collaboration that is sophisticated yet family friendly. 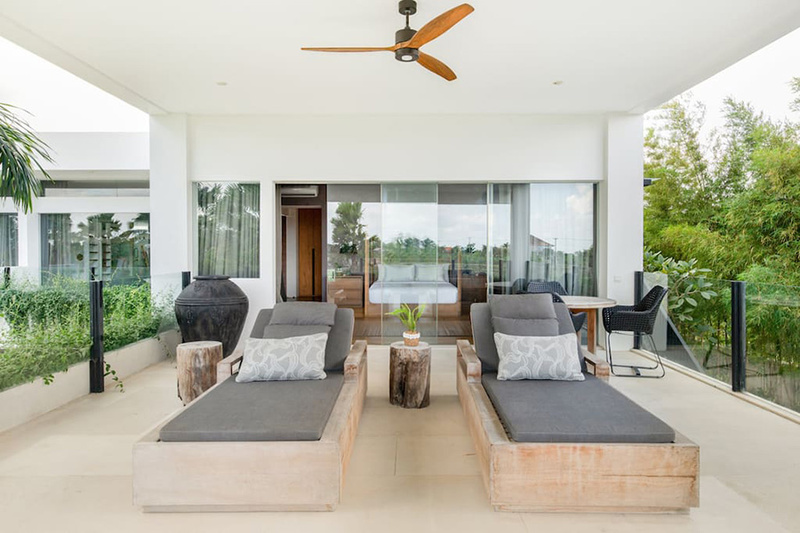 With a dedicated and discreet team of staff to cater to every whim, the villa has five rooms with the option of adding luxury rollaway beds up to 16 guest. The Palm House boasts a 40-metre pool for real swimming and the perfect Jacuzzi corner for sunset drinks. 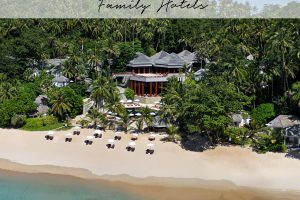 The air-conditioned gym and spa are always open, while the view of lush green lawn with rice paddies and palms beyond will bring ultimate tranquility and relaxation to the most discerning guest. 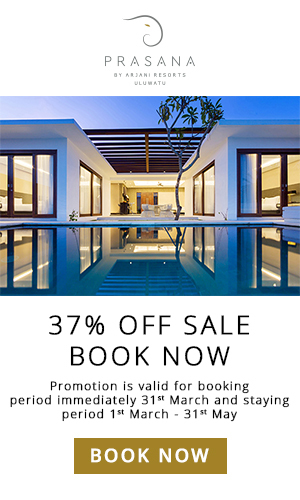 The Palm House has five en-suite bedrooms enveloped in air-conditioned comfort. 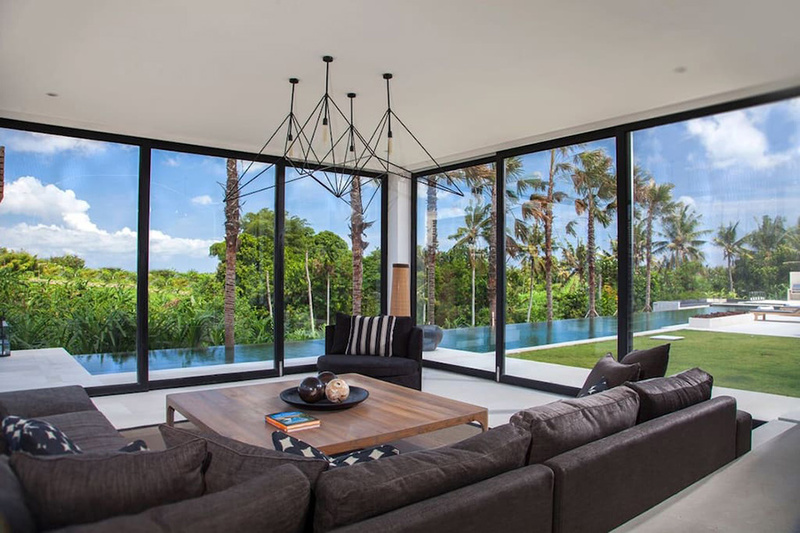 Each room has large picture windows that frame the tropical green views, along with a terrace or balcony. All five rooms are of a similar size and have flexibly configured beds offering both twin and king options. There is also luxury rollaway beds that can be added upon request. For larger groups, the gym and office can be converted to a sixth and seventh bedroom. 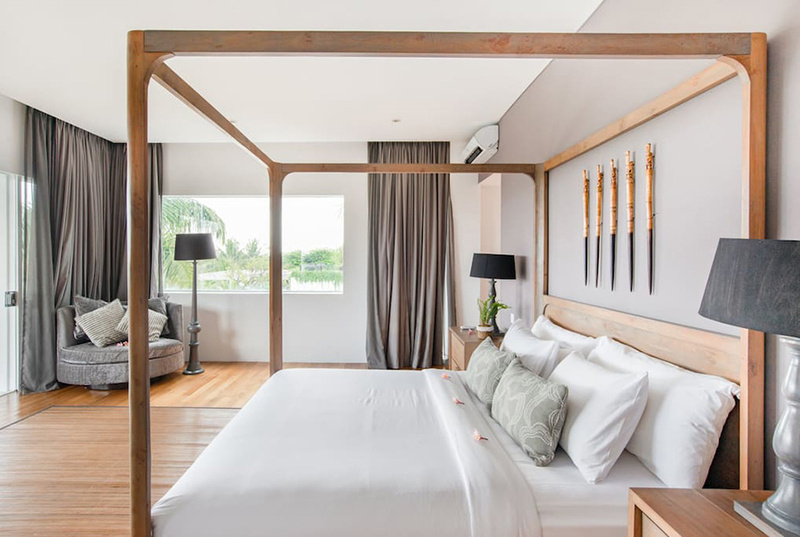 The designs of the bedrooms are understated luxury – softly muted colors mixed with antique woods. Unique pieces of antiques and artwork adorn the walls. 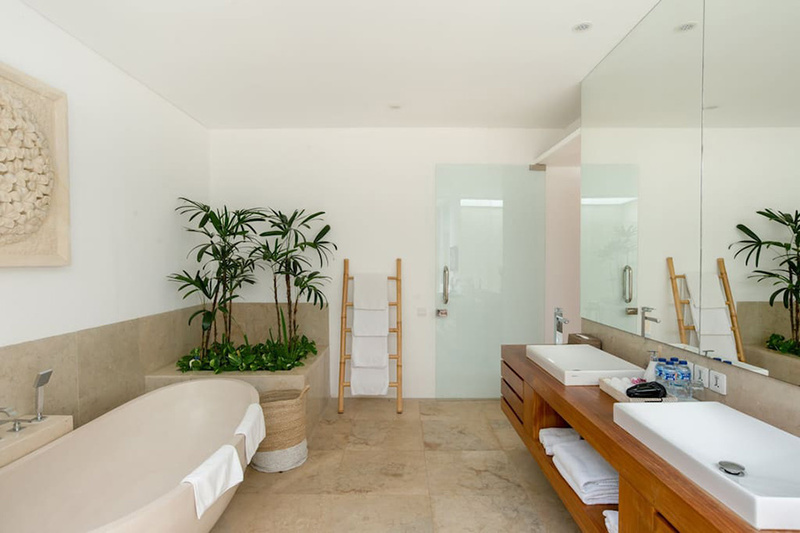 The wardrobes are walk-in and the bathrooms feature a mix of marble and teak wood, an oversized freestanding bathtub, as well as spacious shower stalls. 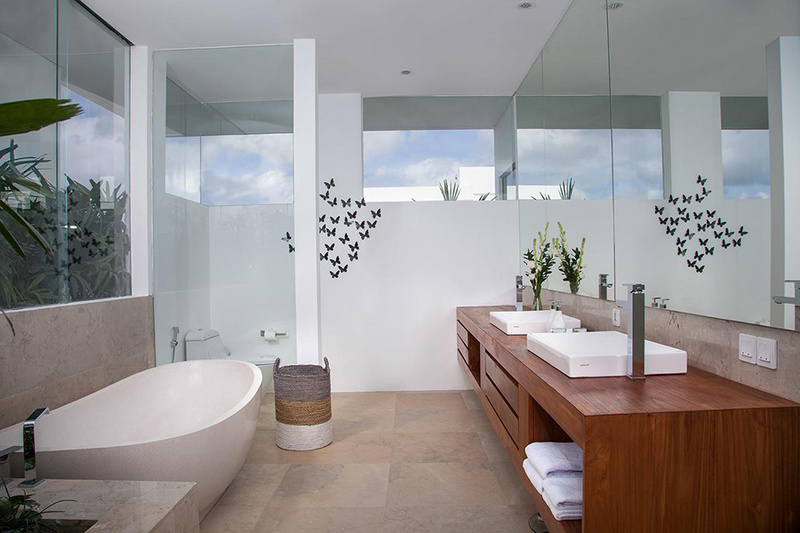 With the exception of the Children’s room, where there is a double head massive shower, in the space of the tub. The mattresses are hotel-grade, thick and luxurious, wrapped in Egyptian cotton bedding. A comfortable sitting area is furnished with a custom-made sofa and desk. Sheer curtains ensure total privacy while enjoying the light, but for those that want to sleep in, every bedroom is equipped with black out curtains. The children’s room has 4 single beds built into the wall – these beds can hold both children and adults comfortably. For children occupancy, we would prepare the room with small table and chairs, arts and craft supplies, toys, books and DVDs. 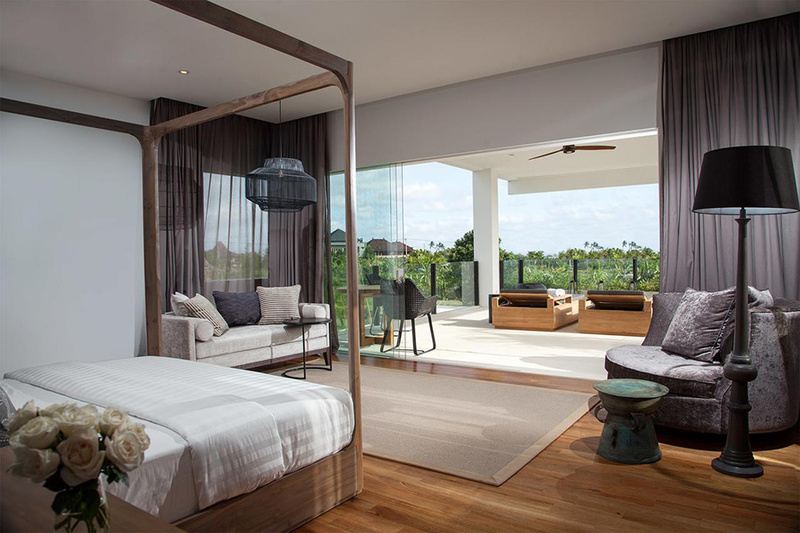 The room also features a lovely reading swing, perfect for looking out onto the tropical views. Up to 16 guest; 4 ensuite bedrooms (3 rooms can be configured as twin beds), 1 room with 4 bunk beds for children, and 4 luxury roll-away beds at a supplementary cost. The outdoor lounge and dining room on the ground floor opens seamlessly onto the manicured grass lawn with expansive pool and jungle views. This formal dining area seats 12 guests. The entertainment room is just off of the main stairway and houses 2 oversized modular sofas with plenty of pillows to go around. This is a perfect place to wind down in the air conditioning while watching your favourite movie, or playing from our selection of board games. The enclosed lounge and dining room directly off the Chef’s kitchen is the heart of the villa. 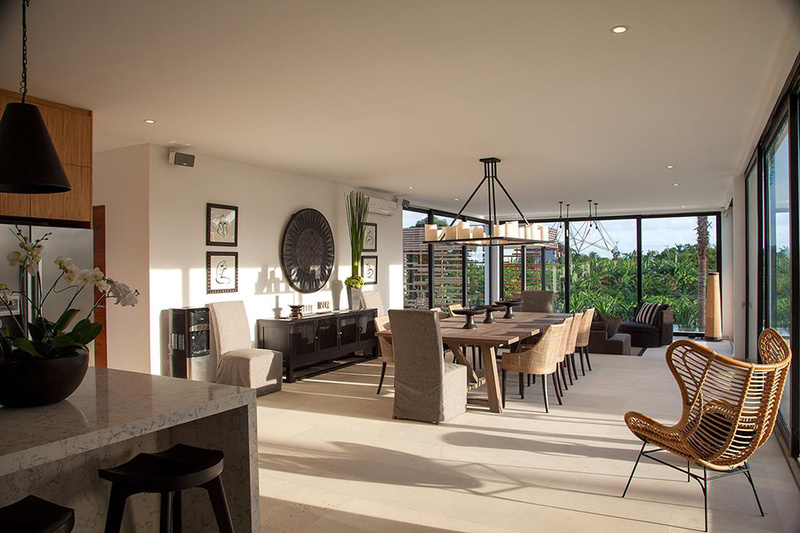 With a dining table for 12 guests where breakfast is normally served, and a superbly comfortable lounge sofa for taking in the sights at the Palm House, many of our guests end up spending most of their time in this part of the house. 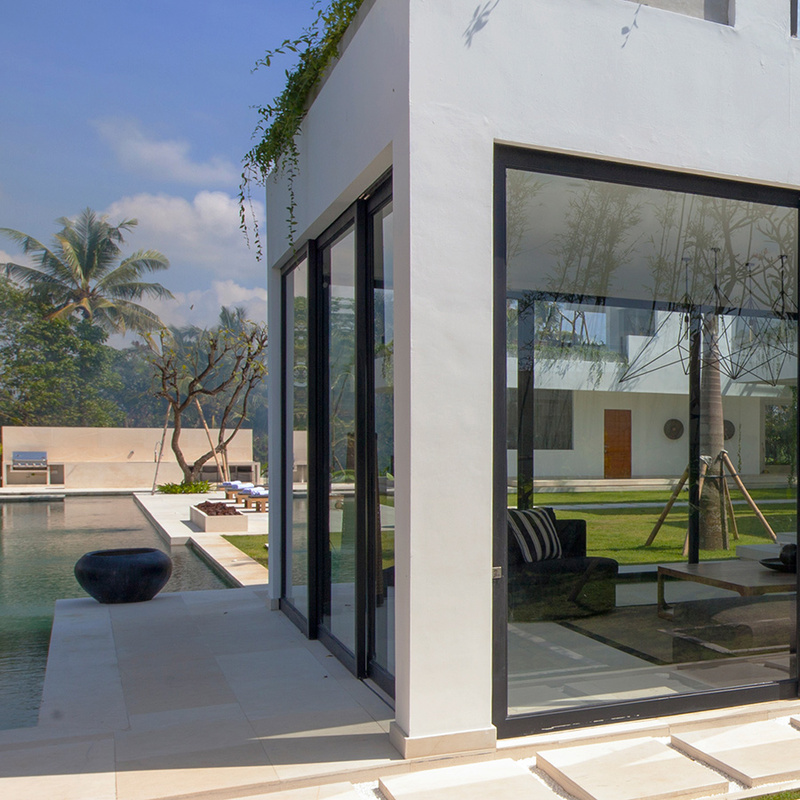 For further outdoor entertaining, there is a sunken living room flanked by the jacuzzi and a large stone fire pit – great for cocktails and casual dining nights. 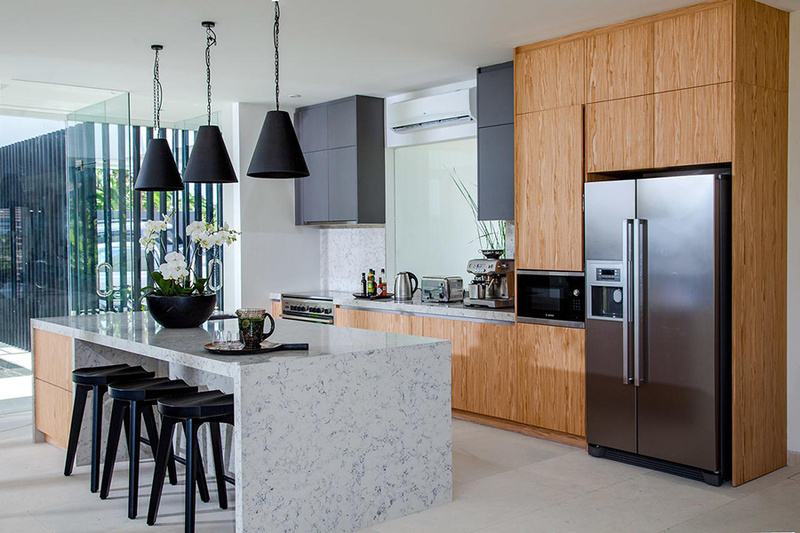 This space, which has a lovely breeze at night, has a large built-in barbecue, sink and fridge alongside a bench style cocktail bar. 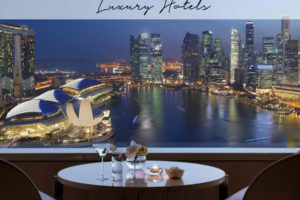 Dedicated concierge, villa manager, private chef, cocktail barman, housekeeping, security; Additional staff such as babysitters, drivers, personal trainers, and masseuses on request with additional charge. A menu of Western, Asian, vegetarian and children’s dishes. Requests accommodated (including special diets). WiFi internet access; mobile phone for local calls, computer, printer and fax for basic use. 75-inch TV screen in entertainment room; DVD player; surround-sound system; SONOS throughout the villa; pool table and ping pong table. Palm House is exceptionally well equipped for families. Facilities include: baby cot; highchair; bath; monitor; changing mats; cutlery and plates; DVDs; games; pool toys. comprehensive spa menu and carried out by professional therapists including sport massage (extra cost applies). 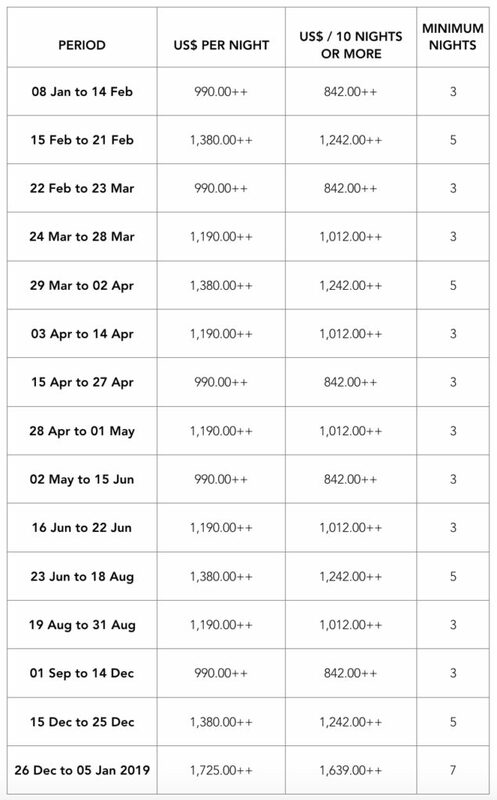 2 motorbikes; A seven-seater car and driver is available (additional charge). Palm House makes a gorgeous event venue and celebrations for up to 100 people can be arranged with prior notice. Barbecue; safety deposit box; motorbikes for guests(additional charge). 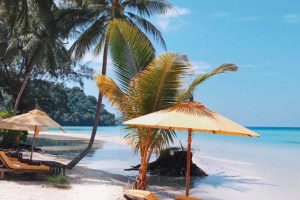 The chef has created a menu that brings together a range of international and Indonesian favorites from gourmet sandwiches and salads to 10 course tasting menus. We use fresh, and wherever possible, organic produce, from chef’s daily trip to the market. A barbecue at the sunken living room is not to be missed, with tasty steaks and fresh lobsters, grilled sweet corn with chili lime butter and quinoa. If you have any dietary restrictions or preferences beforehand, then the chef can adjust the menus accordingly. There is also a delicious and healthy children’s menu for even the most pickiest of eaters. Chef is also happy to take requests and make comfort foods from home – send us the menu in advance or decide when you arrive. Groceries and beverages are charged at market price (plus a 20% handling fee which is subject to service and tax at the prevailing rate). Guests are requested to provide grocery money in advance, and the staff will shop and keep the receipts for reference. 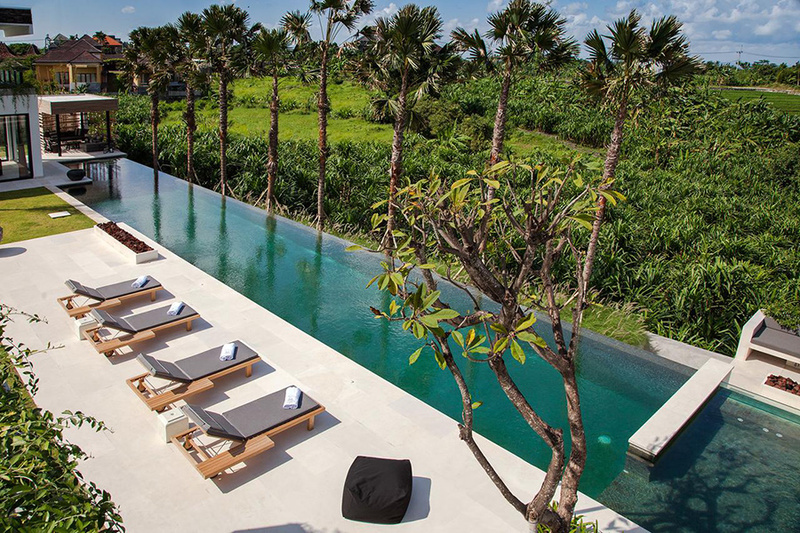 Located in the rural district of Canggu, just minutes from some of Bali’s most revered surf beaches, The Palm House offers incredible sunsets with glimpses of the mystical Batukaru volcano in the distance. 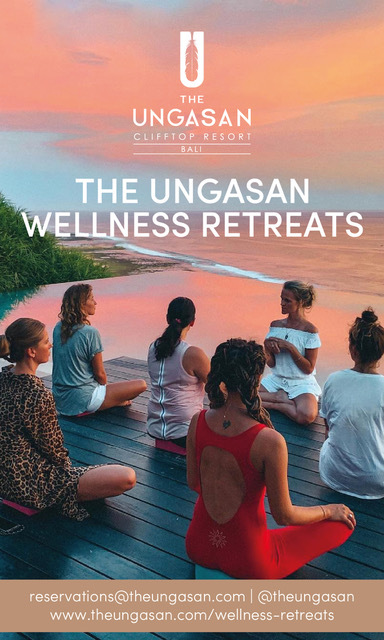 This Bali must-have guide features 60 of the island’s hottest restaurants, beach clubs, cafes & spas – each inviting you to a free main dish, complimentary dessert, up to 30% off your bill & many more unique privileges!